BOSTON — Much like the checkout clerk uses a machine that scans the barcodes on packages to identify what customers bought at the store, scientists use powerful microscopes and their own kinds of barcodes to help them identify various parts of a cell, or types of molecules at a disease site. But their barcodes only come in a handful of "styles," limiting the number of objects scientists can study in a cell sample at any one time. Researchers at the Wyss Institute for Biologically Inspired Engineering at Harvard University have created a new kind of barcode that could come in an almost limitless array of styles — with the potential to enable scientists to gather vastly more vital information, at one given time, than ever before. The method harnesses the natural ability of DNA to self-assemble, as reported today in the online issue of Nature Chemistry. Fluorescence microscopy has been a tour de force in biomedical imaging for the last several decades. In short, scientists couple fluorescent elements -— the barcodes — to molecules they know will attach to the part of the cells they wanted to investigate. 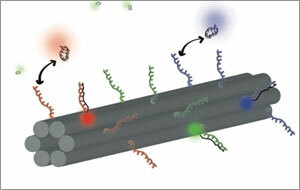 Illuminating the sample triggers each kind of barcode to fluoresce at a particular wavelength of light, such as red, blue, or green — indicating where the molecules of interest are. However, the method is limited by the number of colors available — three or four — and sometimes the colors get blurry. 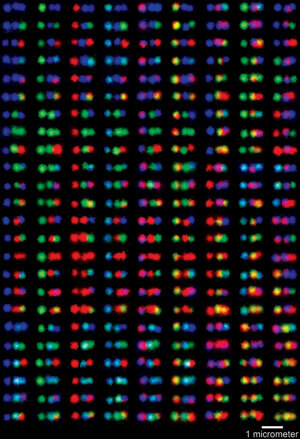 That’s where the magic of the DNA barcode comes in: colored-dots can be arranged into geometric patterns or fluorescent linear barcodes, and the combinations are almost limitless — substantially increasing the number of distinct molecules or cells scientists can observe in a sample, and the colors are easy to distinguish. Here’s how it works: DNA origami follows the basic principles of the double helix in which the molecular bases A (adenosine) only bind to T (thymine), and C (cytosine) bases only bind to G (guanine). With those "givens" in place, a long strand of DNA is programmed to self-assemble by folding in on itself with the help of shorter strands to create predetermined forms—much like a single sheet of paper is folded to create a variety of designs in the traditional Japanese art. "The intrinsic rigidity of the engineered DNA nanostructures is this method’s greatest advantage; it holds the fluorescent pattern in place without the use of external forces. It also holds great promise for using the method to study cells in their native environments," Yin says. As proof of concept, the team demonstrated that one of their new barcodes successfully attached to the surface of a yeast cell. More research beckons, particularly to determine what happens when each of the fluorescent barcodes are mixed together in a cell sample, which is routine in real-life biological and medical imaging systems—but there’s plenty of good news as a starting point. It’s low-cost, easy to do, and more robust compared to current methods, says Yin. "We’re moving fast in our ability to manipulate DNA molecules using origami technology," says Wyss Institute Founding Director Don Ingber, M.D., Ph.D., "and the landscape of its potential is tremendous — from helping us to develop targeted drug-delivery mechanisms to improving the scope of cellular and molecular activities we are able to observe at a disease site using the latest medical imaging techniques." The Wyss Institute for Biologically Inspired Engineering at Harvard University (http://wyss.harvard.edu) uses Nature’s design principles to develop bioinspired materials and devices that will transform medicine and create a more sustainable world. Working as an alliance among Harvard’s Schools of Medicine, Engineering, and Arts & Sciences, and in partnership with Beth Israel Deaconess Medical Center, Brigham and Women’s Hospital, Boston Children’s Hospital, Dana Farber Cancer Institute, Massachusetts General Hospital, the University of Massachusetts Medical School, Spaulding Rehabilitation Hospital, Boston University and Tufts University, the Institute crosses disciplinary and institutional barriers to engage in high-risk research that leads to transformative technological breakthroughs. By emulating Nature’s principles for self-organizing and self-regulating, Wyss researchers are developing innovative new engineering solutions for healthcare, energy, architecture, robotics, and manufacturing. These technologies are translated into commercial products and therapies through collaborations with clinical investigators, corporate alliances, and new start-ups.